Run the rapids or float gently down the C&O Canal. We can teach you how to paddle canoes and kayaks whether you like your recreation wet and wild or peaceful and relaxing, CCA instructors are trained and experienced. You can count on learning to canoe and kayak safely. Don't be left high and dry — join us and learn how to be safe and have fun on the water! See if one of the classes below is what you need to get the most out of your paddling experience. Check the CCA Summer Instruction Program. We offer canoe, kayak, and safety (Swiftwater Rescue) classes. These are CCA sponsored, American Canoe Association sanctioned, classes led by ACA certified instructors. As such, we require the completion of an ACA registration form as well as a CCA registration form. ACA provides the insurance coverage for the classes. Registrations must be received 3 weeks before start of class. Cost varies by type of class. Our Class Schedule is included on our Trip & Events Calendar. Registration is on the class calendar page. CCA membership is not required, but is encouraged. We have a lot of great trips on our schedule. Check Paddling Training Materials for more information. This two-day course is the perfect introduction to the sport of canoeing. Instruction is focused on paddling strokes, boat control, maneuvers, equipment, and safety. Both days will include lessons on dry land as well as on the water. Riley’s Lock provides a convenient meeting place that offers restrooms, ample parking, flat water that is protected from wind and waves, and lots of shade for land-based lessons. Students are expected to provide their own equipment (canoe, paddles, properly fitted personal floatation device, water bottle). Either tandem or solo canoes are suitable, though tandem is preferred. If a student does not have equipment please contact the instructor early to resolve issues. This course is based upon the American Canoe Association’s river canoe curriculum at levels 1 and 2 (available through the links below). This course is designed for paddlers who have successfully completed the Canoeing Basics course or who can demonstrate competence of basic flat-water paddling skills. Students will learn how to transition their flat-water skills to a moving river. Some of the skills that will be practiced in the Whitewater Canoeing course are eddy turns, peel outs, ferries, the infamous back ferry, water reading and hazards, rescue techniques, and equipment selection. Class meets at Violette’s Lock or Old Angler’s Inn (depending on the students level of experience). Both locations provide a playground for the beginning whitewater paddler. Students are expected to provide their own equipment (canoe with added flotation, paddles, properly fitted helmet and personal floatation device, water bottle). Either tandem or solo canoes are suitable, though tandem is preferred. If a student does not have equipment please contact the instructor early to resolve issues. This course is based upon the American Canoe Association’s river canoe curriculum at levels 3 and 4 (available through the links below). Learn to experience the excitement of challenging whitewater rapids in this class. Beginning on flatwater and advancing to whitewater, participants will learn novice skills for paddling a kayak including wet exits, safety, rescue, equipment and basic paddling skills such as braces, eddy turns and peelouts. The class is held locally along the Potomac. The first day is half outdoor class instruction and half flatwater paddling strokes. The second day is mostly whitewater skills. Lead instructors are ACA certified. Class size is very limited so reserve your spot early - first come, first served. Each paddler must supply a kayak with flotation, a paddle, a spray-skirt, a life jacket and a helmet. If you do not have a boat and gear, post on the CCA message board or contact Potomac Paddlesports for rental equipment. Be sure to mention you want the equipment for a CCA class as some offer a discount for CCA classes. For more detailed (essential) information about this class,click here: ACA_Beginners_Kayak_Class. This class covers all the basics of safe paddling: river dangers, how to recognize and avoid them, proper boat and personal outfitting, self rescue techniques, swimmer and boat recovery, trip organization and leadership. The class consists of 2, 8 hour sessions over Saturday and Sunday. Please check the CCA class schedule for dates. 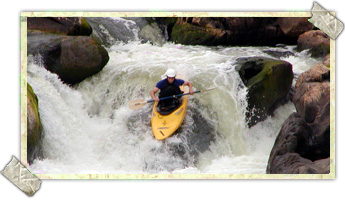 To complete the entire course, participants must be competent in class II whitewater. You must provide your own boats, and equipment.